The raven is the largest of our UK corvids, being much the same size as a buzzard. It looks rather like a giant carrion crow, all black, but with a much more powerful bill. In flight its tail is wedge-shaped, that probably being the best identifier. A raven is often seen before it is heard, and its characteristic prukk, prukk, call often draws attention to it as it soars high in the sky. The raven is found in a variety of habitats, though mainly, moorland, mountains and cliffs. Its preference for cliff-nesting often means it has a nesting peregrine as a near neighbour, though the two species seem to co-exist successfully. It is one of our earliest nesting birds, with more southern populations starting to lay eggs in mid-February, and those further north laying eggs by early April. 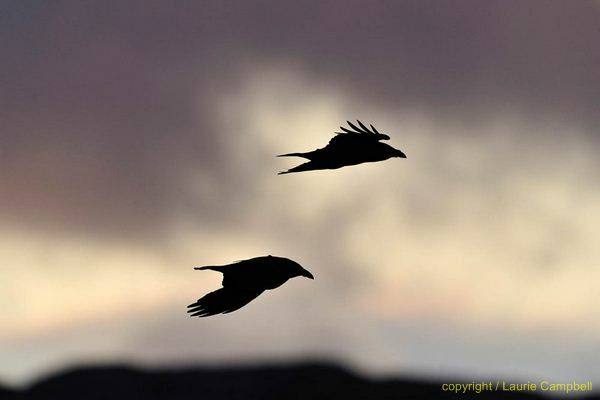 A pair of adult ravens will hold a territory, and use the same nest or nests year after year. Younger ravens are chased out of the territory and are often found feeding in flocks on farmland. 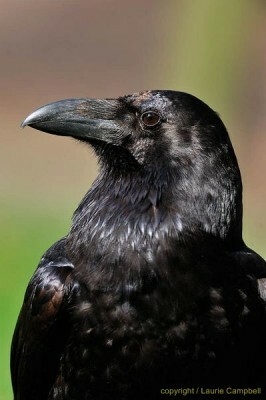 As a typical member of the crow family, the raven’s diet is varied, but includes birds’ eggs, young birds and carrion. Taking game bird eggs brings the bird into conflict with game management, and the fact that it sometimes picks the eyes out of sheep that are lambing or stuck on their back can bring it into conflict with farmers. Some licences are issued to deal with ravens causing a serious problem to agriculture, but occasionally the bird is shot illegally or its nest is deliberately interfered with, causing failure of the eggs or chicks. Egg collectors, for whatever reason, regularly target clutches of raven eggs. This may be because it is one of the earliest nesters or because the nests are a challenge to climb up to (or abseil down to). Ravens nesting on coastal areas of north Wales are often the population that suffers most from this strange breed of criminal.